Let's listen to the largest organ in southeastern Europe at Sala Radio, in a concert conducted by Christian Ciuca! Romanian conductor Christian Ciuca's September 2017 Enescu Festival concert of Mozart's Great Mass in C Minor, in an extraordinary performance by Ensemble Instrumental de Paris and the Madrigal National Chamber Choir. In September 2017, during the Enescu Festival, Romanian conductor Christian Ciuca, who now resides in France, conducted an extraordinary concert, Mozart's Great Mass in C minor, on the Athenaeum stage. Two groups performed at this event: the Instrumental Ensemble from Paris (Ensemble Instrumental de Paris), founded in 1998 by Ciuca himself, and the Madrigal National Chamber Choir, with the participation of four worldwide famous singers. Wednesday, 7th of November (7.00 P.M.), CHRISTIAN CIUCA will be on the Sala Radio stage, where he will conduct the Radio Chamber Orchestra in a Bach/Händel/Puccini concert, with the participation of the Radio Academic Choir (conductor: Ciprian Țuțu). 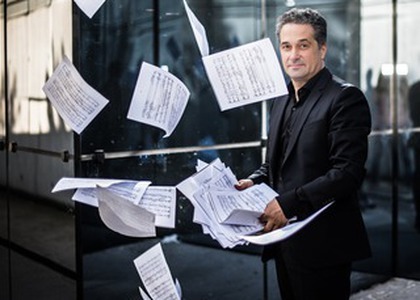 The conductor Christian Ciuca's passion for vocal and symphonic music led him to an oratory repertoire, an area in which he excels, being appreciated as a specialist in France. He conducted works by Händel (Messiah, Dixit Dominus), Bach (Magnificat, Christmas Oratorio), Mozart (Great Mass in C minor, Requiem), Brahms, Verdi, Puccini (Messa di Gloria), Rossini (Little Solemn Mass, Stabat Mater) in Europe. When he was only 21 years old he conducted Puccini's Messa di Gloria in Berlin. This composition will also be featured in concert at Sala Radio, with the participation of singers Nicolae Simonov (tenor) and Cristian Ruja (baritone). The event is also an opportunity to listen to organist STEFFEN SCHLANDT, who performed in numerous European countries, like Germany, France, Switzerland, Sweden, Italy, and so on. In 2001 he received the second place at the Schramberg International Organ Competition in Germany, and in 2003 he received the prize for lied accompaniment at the Würzburg Competition. The organ in Sala Radio is the largest one not only in the country, but in Southeastern Europe, with 7,600 pipes, manufactured in the Czech Republic in 1960. During the first half of the concert you will listen to these pieces performed by organist STEFFEN SCHLANDT: Bach - Concerto No. 1 in D minor (for organ and orchestra), Händel - Concerto No. 13 in F Major, The Cuckoo and the Nightingale. Romanian born French citizen, Christian Ciuca, started studying violin at the "George Enescu" music school in Bucharest when he was 6 years old. He continued his studies in Romania and Germany, where he also studied choral and orchestral conducting. Being concertmaster of the Rostock Philharmonic Orchestra (in Germany), he worked with great artists like Menuhin, Jordan, and Maazel. In Paris he founded the Jubilate Choir in 1996, which he has conducted for almost 20 years. He had collaborations with important artists like Charlotte Rampling, Brigitte Fossey and Patrick Poivre d'Arvor. He has often been invited to conduct gala concerts at Cadre Noir de Saumur,one of which is his concert with the Hungarian Symphony Orchestra of Budapest, an event that attracted an impressive audience of over 10,000 people. Since 2002 he has served as the artistic manager at Musiques au Pic Blanc - a music internship and master course center in Alpe d'Huez in France. Born in Brașov in 1975, STEFFEN SCHALNDT started his musical education with his father Eckart Schlandt, with whom he studied piano and organ. He then studied organ at the Music Faculty in Cluj, church music at the Trossingen Music Faculty in Germany and choral and orchestral conducting in Würzburg. Between 2001 and 2004 he was an accompanist at the "Bach" Society in Würzburg. He is the one who started the "Diletto Musicale" Sacred Music Festival in Prejmer in August 1999. Since September 2004 he is the "Bach" Choir conductor and organist at the Black Church in Brașov. You can listen to the concerts live on all Radio România Cultural and Radio România Muzical frequencies and on www.radioromaniacultural.ro and www.romania-muzical.ro. Tickets for Radio Orchestra and Choir concerts are available on www.bilete.ro, at any Romanian Post Office, in Inmedio shops with the bilete.ro sign and at the ticket office of Sala Radio. For additional information on the Radio Orchestra and Choir please visit: www.orchestreradio.ro.